This version of Plantain Mosa is quite similar to Plantain Puffs because they are both prepared with overripe plantains and flour. But that's where the similarities end because this version looks like pancakes and it is not deep-fried. You need just enough vegetable oil to grease the frying pan before pouring the batter. You need enough water to give the mashed plantain a medium consistency so that it can pass through the sieve easily. Break the egg into a bowl, beat and set aside. 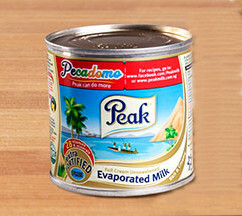 Peel the overripe plantain and mash with a fork till a good blend is achieved. Add cool water to the mashed plantain bit by bit and mix on each occasion till you get a medium consistency. Pass the medium consistency blend through a sieve into the egg. Mix very well. Sift the plain flour into the mixture from Step 4. Mix thoroughly. Add salt, cayenne pepper and evaporated milk and stir very well. It is ready to be fried. Set your frying pan over medium heat and pour a small quantity of vegetable oil; just enough to grease the frying pan. This should be about 1 tablespoon of oil. When hot, pour a small amount of batter into the pan to make a 5mm thick and 5 inch diameter plan-cake. Keep an eye on it and once you see the edge of the plan-cake caking, flip it to fry the other side too. It is ready when both sides are light brown. They should look like the Plantain Mosas in the image above. Fry the rest of the dough using steps 8 to 10. That's it! Serve with a chilled drink: Kunun Aya, Nigerian Chapman, Zobo and many others. 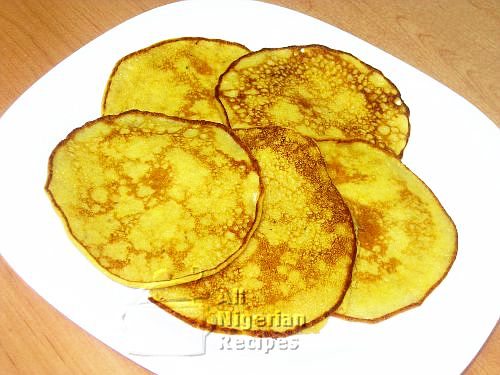 For breakfast, serve with Custard, Ogi/Akamu or with Oatmeal.